I’ve been involved with high-diversity prairie restoration (reconstruction) since I joined The Nature Conservancy in 1997, learning the basics from Bill Whitney at Prairie Plains Resource Institute. We’ve now planted over 1,500 acres of Platte River cropfields to prairie vegetation, using seed mixes of between 150 and 230 species. Those restorations are being used to enlarge and reconnect existing remnant grasslands along the Platte River. About 10 years ago, I started reaching out to other sites doing similar work. Gus Nyberg, then at the Kankakee Sands Restoration in Indiana, and I set up a reciprocal visit between our projects, during which I took some of my staff (and Bill Whitney) to Indiana and the Kankakee staff came to Nebraska. That experience was really valuable for all of us, and convinced us that we needed to do it more often – and to include as many others as possible. Thus began the Grassland Restoration Network. Facilitate communication and cross-site learning among large-scale grassland restoration sites. Identify and close critical knowledge gaps regarding grassland restoration and measures of restoration success. Foster a “grassland restoration culture” that increases the quantity and quality of grassland restoration. Grassland Restoration Network workshop participants discuss restoration strategy in a restored Nebraska prairie in 2009. The Network sponsors annual workshops that are hosted by various restoration projects around the country. In addition to tours, workshops include presentations and discussions on topics including seed harvest/planting, invasive species control, long-term management, and research and evaluation strategies. Those workshops have been attended largely by people working in the central United States, but have also included participants from the Pacific Northwest, long-leaf pine ecosystem in the southeast, and even other countries, including Canada and The Netherlands. GRN workshops differ from other conferences in that the Network focuses on the use of high-diversity restoration as a tool for increasing the ecological viability of prairie ecosystems. For example, we try to enlarge or reconnect small and/or isolated prairies through the conversion of adjacent cropland to high-diversity grassland communities. In other words, we are trying to defragment the prairie landscape to increase the effective population sizes of prairie species (plants, insects, vertebrates) and benefit the whole ecosystem. Success in those cases is measured not only by the establishment of plant species in seedings, but also by whether or not those seedings have increased the viability (long-term sustainability of ecological function) of the remnant prairie(s). Bringing together people working toward this particular objective has had several benefits. It has increased communication between sites to the point that we know what each other are doing and are learning from their experiences. We have also identified common challenges and research questions, and have started several joint research projects to try to address those. Finally, we have been able to take advantage of the size and experience of the group by collecting a number of “lessons learned” regarding the logistics and mechanics of doing prairie restoration. Most large-scale prairie restoration sites have found that broadcasting seed (rather than drilling) is the most efficient and effective planting technique. The manuscript covers a wide variety of subjects, including seed harvest and cleaning, planting, invasive species control, and overall project planning. It also includes a selection of the most pressing research questions facing prairie restoration, as identified by Network participants. If you’re interested or involved in prairie restoration work, I hope you’ll find the manuscript helpful. 2. Start slow, and increase the scale of restoration over time. Many restoration projects, especially those trying to restore hundreds or thousands of acres, feel like they need to start restoring large portions of the total right away. In almost every case where this has been done, the project manager has regretted it later. Because every site is different, it’s important to start by spending a few years doing small scale seedings in order to build up a database of seed harvest sites, test the effectiveness of techniques, and gauge the level of invasive species suppression that is needed. Be sure to experiment with a variety of strategies (seeding method, seeding rates, site preparation, etc.) during those first years so that you can learn as much as possible. Once you feel like you’ve got a handle on effective strategies, you can start ramping up the scale of the effort exponentially. This approach helps avoid initial large seedings that fail to produce the anticipated results, and that become management headaches down the road. 3. Restore a site over multiple years, rather than all at once. This is related to number two, but applies to any site, regardless of scale. Anyone who has spent many years restoring prairies knows that every seeding is unique. The relative establishment of plant species, the response of weedy species, and many other factors vary year to year – often for reasons we can’t yet define. Make that variability a positive thing. If you have 100 acres to plant, seeding 20 acres a year for five years can produce five unique prairie communities that complement each other and increase overall heterogeneity and diversity of habitat and species composition, rather than one large seeding that looks pretty much the same across the whole site. Another approach is to “checkerboard” a seeding; break each year’s seeding effort into several locations, scattered across the larger site, and fill in more blanks every year. 4. If you want plant diversity, maximize that diversity in your initial seedings – don’t plant a low diversity mixture with the idea of coming back later to add diversity. It is much more difficult to enhance the diversity of an established prairie restoration than it is to establish that diversity during the initial seeding process. Attempts to do so tend to have inconsistent results at best. Efficient seed harvesting is an important part of prairie restoration when trying to maximize both acres and species diversity. 5. Adapt your technique as you go. Even if you start small and figure out some apparently effective methods before attempting larger seedings, it’s still important to continue experimenting. Including a couple small experimental plots (1 acre or so in size) within each year’s restoration work, in which seeding rate or other treatments are varied, can provide tremendous information that can help refine your techniques over time. Collecting data from those plots can be as simple as visual observation of differences or more intensive, but without those experiments, you’ll never know whether or not you could be doing better restoration work. 6. Develop a plan, and capacity, for dealing with invasive species before you start. Invasive species are expensive to fight, but the success of that fight is the difference between restoration success and failure. 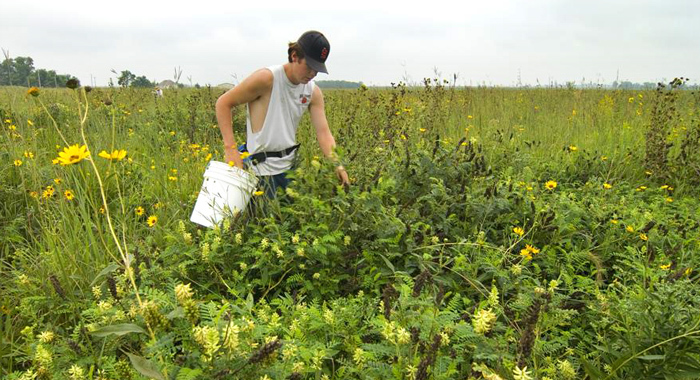 In fact, when a restoration effort is designed to benefit an adjacent remnant prairie, a seeding full of invasive species can actually put the remnant at greater risk than before. There are two factors that should drive the number of acres you plant each year: the amount of seed you can harvest to obtain the desired species composition in the seedings, and the number of acres on which you can deal with invasive species. This is one of the great advantages of starting small – you can evaluate the threat posed by invasive species on small seedings before jumping into large seedings that could overwhelm your available resources. It’s better to do high-quality, but small, seedings than mediocre (or worse) large ones. 7. Finally, one of the most interesting facets of prairie restoration is that there are many ways to do it successfully. It is a field full of innovation and creativity, and it’s wonderful to see varying approaches to common problems. However, through polling participants, we’ve found that there seems to be one set of restoration techniques that is universally successful, regardless of geographic location or other factors. Excepting extraordinary circumstances, a dormant season broadcast seeding onto Roundup Ready soybean stubble will always establish a diverse prairie plant community. This doesn’t mean that the Network is prescribing that specific technique – in fact many of us have had great success with other techniques. But we think it notable that we could identify at least one combination of techniques that consistently produces successful prairie establishment. 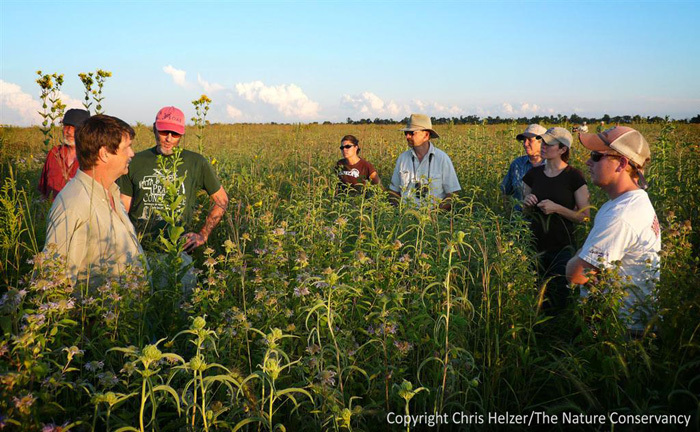 Whether you’re creating prairies for educational, historic, aesthetic, or ecological reasons, it can be a rewarding (if challenging) experience. Because every site responds uniquely to prairie restoration, much of what works for you will likely be learned through experimentation. However, there is also much to learn from others who have been doing similar work in other places. I hope this partial summary of that information will help you. The 2011 GRN workshop has not yet been planned. Stay tuned to this blog for updates about the date and location.